To help class members understand the importance of exercising faith, being humble, and heeding the counsel of the prophets. What Do the Jaredites Have to Do With the Reign of the Judges? Why was Coriantumr's Record Engraved on a "Large Stone"? Why Is The Book of Ether an Epic? Why Did Moroni Comment So Much Throughout Ether? Why Did Snakes Infest Jaredite Lands During a Famine? Donaldson, Lee L. "The Plates of Ether and the Covenant of the Book of Mormon." In The Book of Mormon: Fourth Nephi Through Moroni, From Zion to Destruction, edited by Monte S. Nyman and Charles D. Tate, Jr., 69-79. Provo, UT: Religious Studies Center, 1995. Brinley, Douglas E. "The Jaredites: A Case Study in Following the Brethren." In A Book of Mormon Treasury: Gospel Insights from General Authorities and Religious Educators, 427-441. Provo, UT: Religious Studies Center, 2003. Valleta, Thomas R. "Jared and His Brother." In The Book of Mormon: Fourth Nephi Through Moroni, From Zion to Destruction, edited by Monte S. Nyman and Charles D. Tate, Jr., 303-322. Provo, UT: Religious Studies Center, 1995. LeBaron, E. Dale. "Ether and Mormon: Parallel Prophets of Warning and Witness." In The Book of Mormon: Fourth Nephi Through Moroni, From Zion to Destruction, edited by Monte S. Nyman and Charles D. Tate, Jr., 153-165. Provo, UT: Religious Studies Center, 1995. Sorenson, John L. "The Years of the Jaredites." 1968. Sperry, Sidney B. "What the Book of Mormon Is (Concluded)." Journal of Book of Mormon Studies 4, no. 1 (1995): 28-40. An analysis of the text of 3 Nephi to Moroni. Third Nephi was written by Nephi, the son of Nephi, the son of Helaman. Fourth Nephi in turn was written by the son of Nephi3 also called Nephi, and Nephi4‘s son Amos and grandsons Amos and his brother Ammaron. The book of Mormon was principally inscribed by Mormon and Moroni. The book of Ether exposes the terrible end of a people persisting in wickedness. The book of Moroni shows his love for his enemies. Reeve, Jr., Rex C. Brother of Jared In Encyclopedia of Mormonism, Edited by Daniel H. Ludlow. Vol. 1. New York: Macmillan, 1992. An encyclopedic entry on the Brother of Jared. Tanner, Morgan W. Jaredites In Encyclopedia of Mormonism, Edited by Daniel H. Ludlow. Vol. 2. New York: Macmillan, 1992. An encyclopedic entry on the ancient civilization of the Jaredites. Preece, Michael J. Learning to Love the Book of Mormon - The Book of Ether., 2014. Commentary on the Book of Ether. Miner, Alan C. "The Book of Ether, Chapter 1." In Step by Step through the Book of Mormon: A Collection of Cultural Commentary. Vol. 7. Springville, UT: N.P., 2016. Reference work on all the textual variants found in the Book of Ether. Bowen, Matthew L. "Getting Cain and Gain." Interpreter: A Journal of Mormon Scripture 15 (2015): 115-141. The biblical etiology (story of origin) for the name “Cain” associates his name with the Hebrew verb qny/qnh, “to get,” “gain,” “acquire,” “create,” or “procreate” in a positive sense. A fuller form of this etiology, known to us indirectly through the Book of Mormon text and directly through the restored text of the Joseph Smith Translation, creates additional wordplay on “Cain” that associates his name with murder to “get gain.” This fuller narrative is thus also an etiology for organized evil—secret combinations “built up to get power and gain” (Ether 8:22–23; 11:15). Warren, Bruce W. "Secret Combinations, Warfare, and Captive Sacrifice in Mesoamerica and the Book of Mormon." In Warfare in the Book of Mormon. Edited by Stephen D. Ricks and William J. Hamblin. Salt Lake City and Provo, UT: Deseret Book and FARMS, 1990. In some ways, the rise of secret combinations described in the book of Ether and their relation to warfare and the subsequent captivity of kings parallel the Maya traditions and customs relating to myths of origin, secret combinations, sacral warfare, and the capture and sacrifice of divine kings in pre-Columbian Mesoamerica.1 Just as the Jaredite record states that certain patterns of warfare originated with the organization of secret combinations, the Maya derive their customs of ritual warfare from ancestral gods, practices that they place in the third millennium B.C. Hillam, Ray C. Secret Combinations In Encyclopedia of Mormonism, Edited by Daniel H. Ludlow. Vol. 3. New York: Macmillan, 1992. Encyclopedic entry on secret combinations in the Book of Mormon. They appear throughout the Book of Mormon, and very prominently in the Book of Ether. Peterson, Daniel C. "Notes and Communications - "Secret Combinations" Revisited." Journal of Book of Mormon Studies 1, no. 1 (1992): 184-188. The claim that the Gadianton robbers in the Book of Mormon are merely a reflection of nineteenth-century Masons, who were referred to in the late 1820s as “secret combinations,” is false since an 1826 use of the phrase establishes that those words were not used exclusively to describe Masons. Benard, David R., John W. Welch, and Daniel C. Peterson. "'Secret Combinations'." In Reexploring the Book of Mormon, edited by John W. Welch, 227-229. Provo, UT: FARMS, 1992. Critics argue that the "secret combinations" in the Book of Mormon are references to the society of Free Masons from the 19th century. This article demonstrates the illogical nature of that claim. Oman, Nathan. "'Secret Combinations': A Legal Analysis." FARMS Review 16, no. 1 (2004): 49-73. This article addresses the belief that the account of secret combinations in the Book of Mormon is a satire on Masonry. Many scholars claim that the term secret combinations was exclusively used in the 1820s to refer to Masonry. However, Nathan Oman points out that this term was also used in legal situations to refer to criminal conspiracies. Tvedtnes, John A. "Hiding the Secret Plans." Insights 22, no. 8 (2002). The Second Conference of Abbot Serenus 21, written about a.d. 426 by the Christian scholar John Cassian, sheds light on statements made in the Book of Mormon (Ether 8:15) and the Book of Moses about Cain, who slew his brother Abel, and the beginning of secret combinations. This article addresses the mention of "silk" in Ether 9:17, which is thought to not exist in ancient America. This problem may be an issue of linguistics, as fine fabrics were known in ancient America, which the Spanish conquistadors termed "silk." FairMormon entry on "cattle and cows." This article addresses the mention of "cattle," "oxen," and "cows" in Ether 9:18. This article addresses the mention of "swine" in Ether 9:18. This article addresses the mention of "elephants" in Ether 9:19. This article gives a possible explanation for the unusual behavior of the serpents during the drought mentioned in Ether 9:31. FairMormon entry on "Serpents and Drought." This article addresses the confusing behavior of the serpents during the drought in Ether 9. Their behavior may be traced to natural animal behavior during times of famine and drought. Nibley, Hugh. "Some Test Cases from the Book of Ether." In An Approach to the Book of Mormon. Salt Lake City and Provo, UT: Deseret Book and FARMS, 1988. In this chapter, Hugh Nibley picks out some peculiar items in the Book of Ether to show how they vindicate its claim to go back to the very dawn of history. In Ether the reign and exploits of King Lib exactly parallel the doings of the first kings of Egypt (entirely unknown, of course, in the time of Joseph Smith) even in the oddest particulars. The story of Jared’s barges can be matched by the earliest Babylonian descriptions of the ark, point by point as to all peculiar features. This article addresses the mention of "silk" in Ether 10:24, which is thought to not exist in ancient America. This problem may be an issue of linguistics, as fine fabrics were known in ancient America, which the Spanish conquistadors termed "silk." This article deals with various textual variants in the Book of Mormon. In Ether 11:4-9, the reader encounters the character "Shiblom," which is spelled differently than the "Shiblon" found in Ether 1:11-12. Larsen argues that this is the same person, but simply exhibits a different spelling. Rasmus, Carolyn J. "'Weak Things Made Strong'." In The Book of Mormon: Fourth Nephi Through Moroni, From Zion to Destruction, edited by Monte S. Nyman and Charles D. Tate, Jr., 251-262. Provo, UT: Religious Studies Center, 1995. The 58 words which comprise Ether 12:27 are powerful and instructive; however, this verse becomes increasingly meaningful when we examine the context in which the Lord gave this instruction to Moroni, analyze other scriptures related to it, and apply the principles taught by the Lord in our own lives. Tvedtnes, John A. 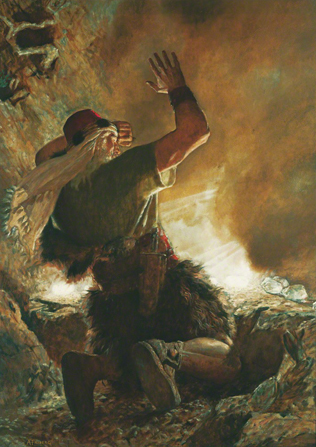 "The Timing of Christ's Appearance to the Nephites." In The Most Correct Book: Insights from a Book of Mormon Scholar, 251-269. Salt Lake City: Cornerstone Publishing, 1999. Most casual readers of the Book of Mormon probably conclude that Jesus Christ appeared to the Nephites immediatelyafter the great cataclysm accompanying the crucifixion, when the thick vapor dissipated. However, this assumption has been questioned by several scholars. Ether 12:7 teaches that Christ did not appear unto the Nephites until they had shown that they had faith in Him. Welch, John W., David Fox, Roger R. Keller, Paul Y. Hoskisson, Deloy Pack, Robert F. Smith, and Bruce W. Warren. "Words and Phrases." In Reexploring the Book of Mormon, edited by John W. Welch, 282-285. Provo, UT: FARMS, 1992. Ether 12:25 states that the words of the Book of Mormon are "great and powerful." This article explains some distinctive words and phrases uniquely found in the Book of Mormon that support the Book of Mormon's ancient origins and authenticity. The name Heshlon, attested once (in Ether 13:28), as a toponym in the Book of Mormon most plausibly denotes “place of crushing.” The meaning of Heshlon thus becomes very significant in the context of Ether 13:25–31, which describes the crushing or enfeebling of Coriantumr’s armies and royal power. Sorenson, John L. "When Lehi’s Party Arrived in the Land, Did They Find Others There?" Journal of Book of Mormon Studies 1, no. 1 (1992): 1-34. While this article focuses mostly on the different civilizations that may have interacted with the Nephites, the Jaredites also likely interacted with surrounding cultures. The book of Ether experiences extreme fluctuations in population dynamics that would be hard to achieve with a single family. The Jaredites most likely interacted with, and lived with people of other civilizations that accounted for their immense numbers by the end of the book of Ether. 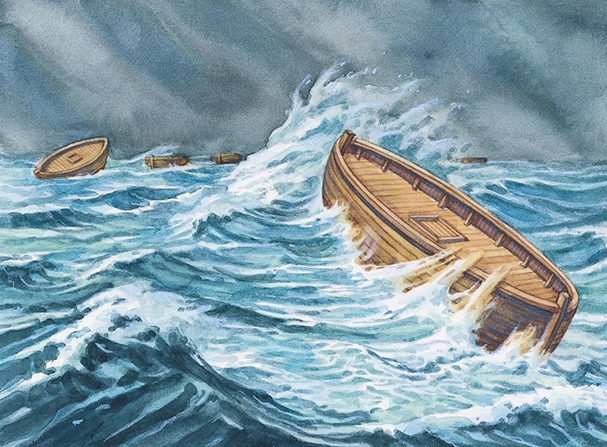 This article examines several interesting discoveries pertaining to the Book of Mormon. Anthony W. Ivins suggests that the Jaredites may not have been completely extinct, that Coriantumr, the alleged last Jaredite, may have had children with Mulekite women after he discovered the people of Zarahemla. A wooden vessel that was found in Lake Michigan turns out to be a prototype of a proposed “sea-going tow barge” developed in World War II for the Navy. Arrowheads discovered in Israel show that steel was in use by about 1000 bc; the name Aha was engraved with steel on one arrowhead, thus giving a Hebrew-language source for this name found in the Book of Mormon. Researchers have found similarities between the Anthon Transcript and Old South Arabian (Arabic). This article discusses the long-held LDS belief that modern Native Americans are the exclusive descendants of the Lamanites. Roper discusses the various possible ancestral lines of the modern Native Americans and where this belief originates in LDS thought. Roper, Matthew. "Book of Mormon Swords in Mesoamerican Antiquity." Insights 28, no. 2 (2008). In Ether 15:30, Coriantumr leaned upon his sword before decapitating Shiz. Roper discusses the nature of swords in the Book of Mormon and how these were more likely the mesoamerican "machuahuitl" rather than the European steal blades. In Ether 15, the head of Shiz gets cut off, yet he seems to raise himself up and gasp for breath. This article explains how this description is consistent with medical sources on decaptitation. FairMormon entry on "Shiz struggles to breath." This entry explains the medical phenomenon of a person breathing after decapitation, as found in Ether 15:31. Welch, John W. Preliminary Comments on the Sources behind the Book of Ether. Provo, UT: Foundation for Ancient Research and Mormon Studies, 1986. Sorenson, John .. "The 'Mulekites'." BYU Studies Quarterly 30, no. 3 (1990): 6-22. The Book of Mormon: Fourth Nephi Through Moroni, From Zion to Destruction, Edited by Monte S. Nyman and Charles D. Tate, Jr.. Provo, UT: Religious Studies Center, 1995.